On Christmas eve, I decided I needed something comfy to wear during our flight to Atlanta on Christmas day. Nothing like a silly self-imposed deadline to get motivated on a sewing project! The Lady Skater pattern fit the bill perfectly. I considered using my modified Renfrew Top pattern for the bodice since I’m pretty happy with the shoulder fit, which is always the most challenging for me. But, why not try something new? I noticed the armscye was a tad longer on the Lady Skater. Perhaps the more relaxed underarm fit would be more comfortable. As usual, I had to let the waist out and raise it up. I’m neither long or short waisted but I’m shorter than most at 5’2″. 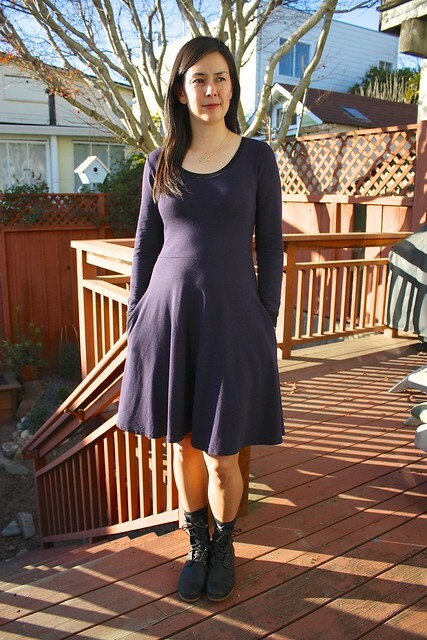 I prefer the look of knit dresses that hang from the natural waist. In the end, I had to take in a lot under the arm. It turns out the closer fit is plenty comfortable and looks better. The fabric I used has been sitting in my stash for months. It’s a soft yet stable bamboo jersey with lycra. I love this color. I wanted to contrast the neck and armbands in a subtle way so I chose black. Totally digging on that. I added inseam pockets, even though I knew it would mess up the skirt drape on the sides. Too bad. I need pockets!! Conclusion: I need more of these! Not only was I comfortable on my plane ride, I’ve been living in this dress several days a week ever since. Easier to wear than pajamas, seriously. For any of you out there that are nervous about sewing knits, this pattern is a great place to start. The directions are very thorough and chatty in a good way. Highly recommended! 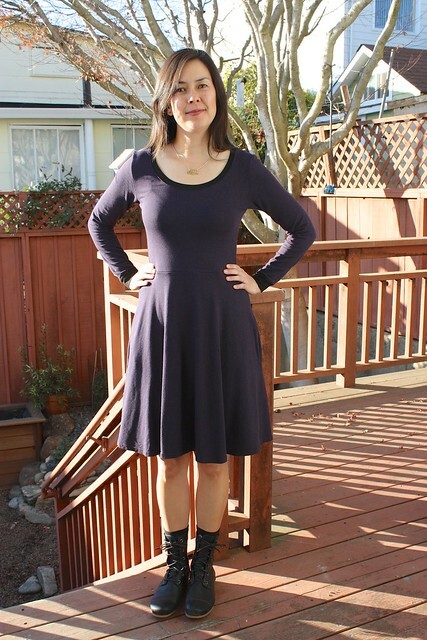 While you can totally sew this dress with a standard sewing machine, a serger makes all knit projects go so much faster with a more professional finish. If you are looking for an affordable, entry level serger that is easy to thread, I recommend the Brother 1034D serger. My mother-in-law gave me one for my birthday a few years ago and it has completely changed the way I sew. I use it on almost every project, including wovens. I also use a twin needle to finish neck and armbands and for hemming – standard practice for knits if you don’t have cover stitch capability. One day, I might upgrade to a more full featured serger, but I honestly have no complaints with my current setup.